Has anyone ever seen this set of bowls before? These wonderful turquoise, Pyrex Gooseberry bowls. As in.... with your own eyes? I am in love with them and found them listed in Pinterest. I do not own them. But you can see them posted here. 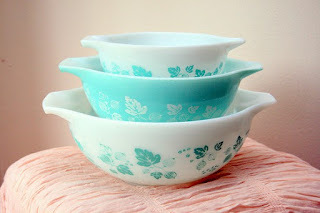 I am really curious if anyone has seen them out in the wild, on your adventures in finding Pyrex. I have never ran across them. And I am wondering if they are even findable. Or if they may have been a very limited promotional piece. I want them so bad! And no, I've never encountered them in real life. I've never encountered them in the wild either, but I'd sure love to find them!